It’s a bit early yet, but time to take a look at the 2016 schedule. As of today’s list posted at RedRocksOnline.com, there are 109 concerts already scheduled, counting the January event. For the peak months of June, July, August this represents more than 80% of available nights booked, but still leaves room for additions. For the entire mid-April through mid-October season, 60% of the nights are booked. This does not include Film on the Rocks events, which are not yet listed on the online schedule. In addition, we understand a 75th Anniversary event is being planned. Last year, an online sound survey racked up 190 individual ratings for 70 out of the roughly 130 shows. The survey form was more challenging so this is considerably fewer than the nearly 500 responses we received on the 2014 concerts. To no one’s surprise, Bassnectar topped the chart, with 33 ratings for his three nights yielding an average of 3.9 on a scale of 1-5. Although Bassnectar was going for a record, Global Dance and Smashing Pumpkins rated higher, with a solid 4 and 4.3 respectively, but they received fewer total ratings. We have not yet heard whether the online sound surveys managed by Arts & Venues will be used this year. The evening started out pretty mellow last night, noise-wise, in fact surprisingly so. But Bassnectar most likely wasn’t on stage until after 10, and noise escalated some after that. Let us know what you experienced, please! Tonight’s concert, the third of the series, should at least end by 11:45 p.m., according to the weeknight schedule restriction. Lindsey Stirling is new and different—read about her at RedRocksOnline.com. 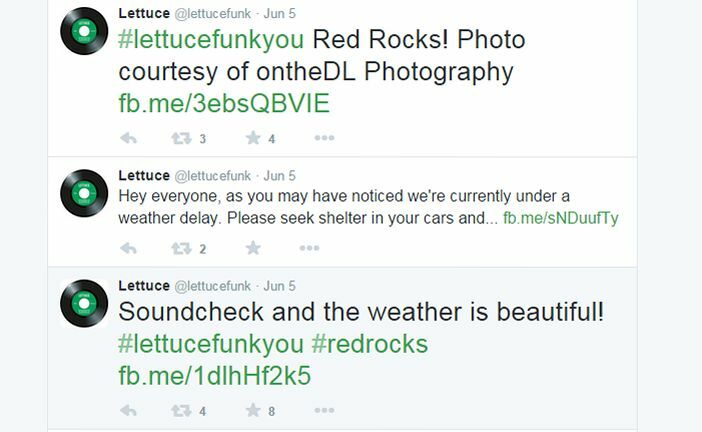 It was a rough night for fans last night, as Nature’s light show took center stage between 9 and 10 p.m. Red Rocks Amphitheatre experienced a “rain delay”—more like a lightning, heavy rain, and hail delay from our viewpoint—that kept headliner “Decemberists” off the stage until after 10:30 p.m. A heavy rain of tweets informed concert-goers they should take shelter in the Visitor Center or their cars. Many got to their cars and simply left, no doubt cold and drenched by then. We’ve captured some of the venue’s tweets in this image. Click to enlarge it, or check it out on twitter. But the show went on! Let us know if you heard it, or if it seemed to go overtime due to the delay. So, the thumping started before noon today and continued (according to our reports) off and on through 6 p.m. or so. The concert was scheduled to start at 6:30 p.m. 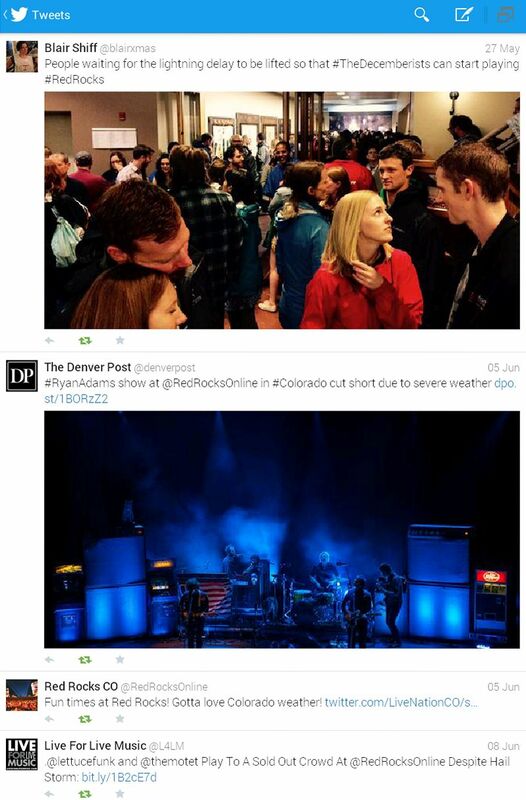 According to @RedRocksOnline’s latest tweet, Odesza is on stage now. What will the rest of the evening bring? Please let us know what you hear, AND call the hotline at 720-865-2494 so they know what your experience is. Thanks! !